Rakusan did not include the Fan Series in his main sequence numbering. Therefore, the original number used for each of the 36 Series prints has been modified to identify the Fan Series members of its theme. The five different fan silhouette shapes have been here assigned arbitrary numbers 1 through 5. To indicate a fan design these shape designations are added to the 36 Series number separated by a hyphen. 131-5 is the Fan Series design with fan shape 5 in the 131 Freshwater Crab theme. Like all other designs in this series, 131-5 was only produced in a single print run, and few copies are currently documented. 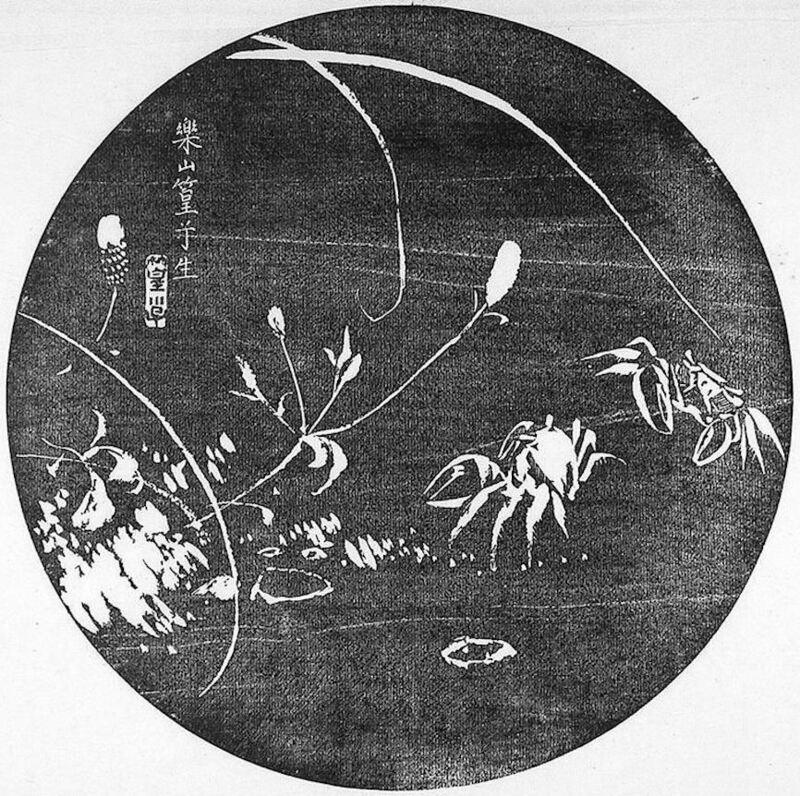 The signature and seal markings suggest that the designs in the 131 Freshwater Crab theme were produced in at least two stages. Two of the five fan designs in this theme (including 131-5) have seal C which indicates a carving date during the first half of 1934. 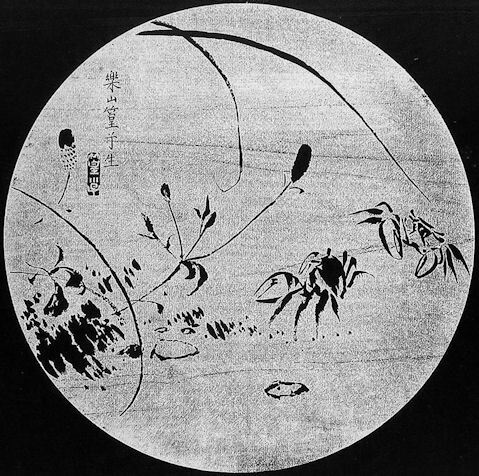 Despite the early completion of some of its wooden blocks, Rakusan delayed printing and distribution of the prints in what became the 131 Freshwater Crab theme until the following year. It was eventually grouped with other summer season themes nearer to the end of the series. Two other fan designs and the 36 Series design 131 have seal B which suggests those designs were carved closer to the time of publication. The remaining fan design has rare minor seal Q whose major seal carving period remains to be determined. The composition of 131-5 includes two small river crabs, a few stems of burnet with three flower clusters, and three long blades of grass. There are several small stones and a dirt bank suggested by groupings of diagonal lines. It is probable that Rakusan oriented the design so that the natural grain of the wooden block would suggest water. All of the elements are rendered in a very loose style with lines and shading closely mirroring the orignal sketch. The result works equally well as ishizuri or reversed. Garden (Great) Burnet, Sanguisorba officinalis var. carnea, 吾亦紅, 吾木香 is today correctly read われもこう, ワレモコウ waremokou. However, in the caption for 100 Series design 56 Rakusan instead wrote われもつこ (newer orthography われもっこ), waremokko, which would today be considered a mistake. Also included in the design is an as yet unidentified grass with very long leaves. A similar grass is included with garden burnet in 100 Series design 56. There the leaves are shown as medium green on the top with a lighter midrib, and a silver-gray underside. In the title supplied here it is called simply 草, kusa, 'grass'.